Two new Barth books arrived in the post this week, all the more exciting because they are primary documents rather than new books about Barth. 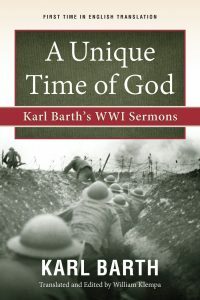 The first A Unique Time of God: Karl Barth’s WWI Sermons contains thirteen sermons preached by Barth to his small congregation at Safenwil from July 26 through November 1, 1914 – the first three months of the war. Here is the young pastor Karl Barth, twenty-eight years of age, wrestling with the meaning of the war in the light of Scripture and theology. Nine of the sermons are based on New Testament texts, and four on the Old Testament. This is the first time these sermons have been translated for an English audience, and I am very much looking forward to reading this volume, together with its introductory essay by Canadian translator and editor William Klempa. The second volume is also early Barth. 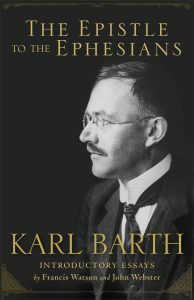 The Epistle to the Ephesians were amongst the first lectures given by Professor Barth in the winter semester at Göttingen, 1921-1922, just months after Barth had ended his pastorate at Safenwil and finished the second edition of his Romans commentary. It seems Barth spent most of the course exegeting his way through the first chapter of the epistle, and then devoted the final lesson to chapters two through six! This volume also comes with introductory essays by Francis Watson and the late John Webster. So war, even this terrible war, has its place in God’s purposeful design of peace for us. Hence, for us men and women, what matters is that we have a living experience of the wrath and of the unspeakable grace of God, to which the European nations now tread so near. Nothing else will help us. In this time, victory and defeat can again be quickly reversed. For thousands of years the history of humanity has simply been a story of alternating victories and defeats. God has permitted time and again that humanity would go its way and on its way find only misery. Victory and success should no longer be what they want; what do they get out of them? Surely, we should all let God speak to us through the present storm, for which human beings are at fault. This will pass away, but you remain! As long as we keep on praying only for victory and success, God will not hear us, and we will continue to be confronted by new storms through our own fault. Lord, set us free, not from the enemies but from the powers of darkness that are in and around us, from falsehood and arrogance, meanness and thoughtlessness. Lord, let us be victorious, not over foreign nations but over ourselves, over our selfishness. Lord, let us triumph, not in outward success but in letting ourselves be filled and empowered with your love, freedom, and justice. Dear friends, let this be our war prayer, the war prayer of a neutral nation. . . . May God grant this. If we so pray, God hears us. The new issue of Crucible has just been published online and is available here. pressing issues facing our world today is mass migration. From the “boat people” debate in Australia to the refugee crisis in the Middle-east and Europe, the world is struggling with some of the biggest mass migrations in history.” There are several peer-reviewed articles addressing this matter, some other articles and resources, plus book reviews including my own review on Frank Macchia’s Baptized in the Spirit. I cannot help but wonder if Lavater thought of himself or his class as wise, good, humble, generous, great, and magnaminous! trans. Christopher Asprey (Vancouver: Regent College Publishing, 2007). I want nothing more than the church, and her scholar-preachers, to be able to offer, in one unified voice, as a part of her calling, a confident word to the world. It is my simple hope and prayer that the Pastor and the Professor can work together toward the recovery of courageous and powerful biblical preaching (28). 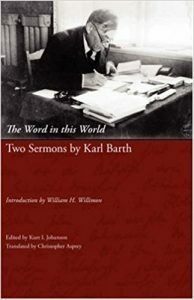 Thus the book is concerned with Barth as homiletician rather than theologian, although in truth, the two cannot be separated: “The main value of Karl Barth for us contemporary preachers is that he is a theologian,” says Willimon (10), for “thin descriptions of God are killing our sermons” (18). Thus, Barth’s insistence on the priority of the biblical text, on giving “close, obedient attentiveness” to God by means of this text is what preaching is about. Further, this attentiveness concerns itself, says Eberhard Busch, not simply with what God said once-and-for-all, but with what God says. “Barth learned from the Reformers that the sermon in the service of worship is to correspond to the prophetic office of Jesus Christ” (7-8). 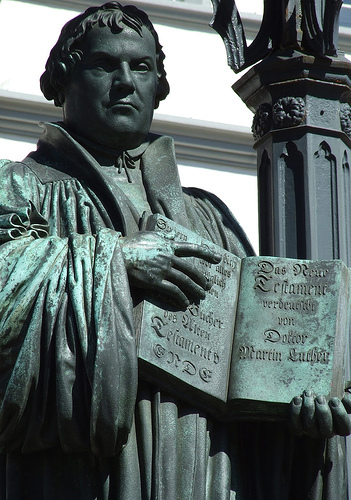 So what do we find in Barth’s sermons? The first, from April 1912 when Barth was just twenty-five years old and a newly-minted pastor, is a pastoral response to the sinking of the Titanic which had occurred earlier that week. 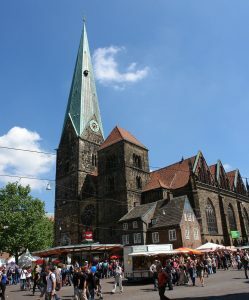 The second, from November 1934, was preached in Bremen’s Frauenkirche in the darkening days of the Nazi regime. The first is the work of the young “Red” pastor of Safenwil, the second, that of the seasoned professor of Bonn (although he was stood down from his position shortly afterwards) and a leader in the Confessing Church. In Barth’s Titanic sermon we see the young liberal pastor at work. His text is not Scripture but a world event. For this Barth, God speaks to and addresses us through these events, though we must make the meaning from them. Barth assumes that we can read the will and purpose of God in and through the events of the world. The “divine spirit in humanity” is equated with human progress, creativity and inventiveness. God wills this progress, this mastery over nature (36). We see also the young socialist pastor at work as he blames the disaster on capitalism. Barth even notes that the president of the shipping company “is among those who have been rescued—unfortunately, we are almost tempted to say” (40)! The way to counteract paganism in the form of National Socialism is by close, obedient attentiveness to another God. The very form and structure of the sermon is itself a kind of theological claim (Willimon, 21). No longer the young, liberal, we see here Barth as an ecclesial theologian of the Word, doing theology for the sake of proclamation, that the church might truly be the church, bound only to one lord, and thus truly free. 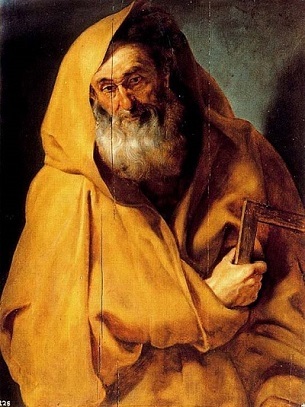 Discernment in the time of decision is often unclear and even fraught. But the church must risk obedience and act. We do wait; we must hasten! And Christ is with us. Perhaps you would have to be a preacher to know why Barth’s being a resolute theologian is his greatest gift to contemporary preaching. It’s not only that much contemporary theology languishes in the realm of theologies-of-this-and-that, but also that much of contemporary theology appears to have forgotten both the proper subject and the vital agent of Christian preaching. Forgive me for having this so prominently on my mind, but I have just finished listening to the sermons of sixty of the preachers who are under my care. Many of the sermons were lively and engaging and most congregations would hear them gladly on a Sunday morning. Yet in a depressing majority of them there was little indication that the content of the sermon or the engine driving the proclamation was the gospel of Jesus Christ. Other than that, most were fine sermons…. (Willimon, in Johanson (ed), The Word in this World, 11). One sermon began well enough, the Second Sunday of Christmas, Luke 2, young Juses putting the temple elders through their paces, abandoned by Mom and Dad. After reading the text, and noting Jesus’ amazing ability to stupefy professional scholars, the preacher then sailed off into a veritable shopping list of things to do. We were told that we needed to resolve, in the coming year, to be more proficient in study of God’s word. We should all strive to “increase in wisdom and in stature.” We ought to spend more time with our families. Barth’s robust view of an active, unfailingly surprising, living God puts Barth at some distance from lots of the sermons that I hear and many that I preach. 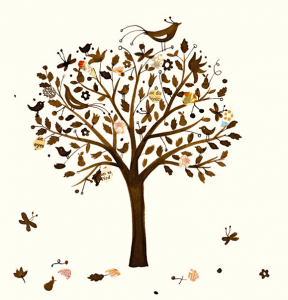 God too often enters the sermon as some sort of vague mystery about whom little is to be said. So we must quickly abandon the text and sail by the seat of our pants, offering exclusively human advice derived from limited human experience. There is a modern sort of modesty that refuses to claim too much for God. Presuming to be intellectual integrity, this reticence to do theology is in most cases the simple fear that to speak decisively about who God is and who God isn’t would endanger our godlike aspirations to run the world as we damn well please. Thin descriptions of God are killing our sermons (11-12, 18).